Why is part of my ring changing color? 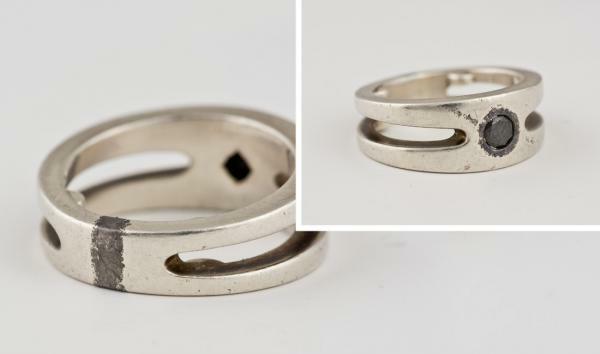 Can you tell where solder was used on this silver ring? Solder is the unseen “glue” that holds most jewelry together. If you have ever had a ring sized, a chain repaired, or your wedding set joined together, you have very likely seen solder in action. But, what is solder and how is it different than the rest of the metal that makes up your jewelry? To answer this question we first have to understand metal alloys. If you haven’t already, now would be a great time to read our article on gold purity. Now you should know that the metals that make up our jewelry are actually a mix of multiple different metals in different combinations called alloys. For the sake of simplicity, we will focus our discussion on gold jewelry, but the same concepts also apply to silver and platinum as well. If your ring is made out of 14 karat gold, you know that approximately 56% of it is gold with the rest being made up by a variety of different metals like silver, copper, nickel, and so on. Each of these other metals contributes some of their unique properties of the final alloy changing its color, hardness, flexibility, and more. That’s great, but what does this have to do with solder? With solder a different set of alloy metals are used than with regular karat gold with the purpose of lowering the melting point of the finished metal. These metals–usually zinc, cadmium, tin or indium–all have low melting points, and by controlling exactly how much of these metals are used metallurgists can determine the precise melting point of the finished alloy. Here is where things get interesting. In addition to contributing their low melting point to the finished alloy, these solder specific alloys, also contribute some of their other properties to the finished product. solder specific alloys contribute some of their easy-tarnishing properties to the finished metal. One of the reasons why we all love gold is that it is so resistant to tarnishing or discoloring over time. Tarnishing, also called oxidization, is a result of chemical reactions between the metal and elements in the air and liquids that it comes in contact with. The result of this reaction is a new molecule that does not have the same color properties as the old one which leads to discoloration. Unlike pure gold, base metals are not nearly as resistant to tarnishing. These metals can easily have those chemical reactions with the elements around them causing them to discolor. By adding additional base metals to solder alloys the finished metal becomes susceptible to reactions with even more elements causing solder joints to tarnish and discolor more quickly and in more circumstances than the karat gold alloys around them. In other words, the solder specific alloys contribute some of their easy-tarnishing properties to the finished metal. This is what happened to the ring in the example photos above. It was worn in a swimming pool, and the chlorine reacted with the base metal alloys in the solder but not with the more noble (tarnish resistant) silver alloys in the rest of the ring. This caused all of the solder to discolor and become visible. After a few days or weeks of wear, this discoloration usually disappears and the solder is once again indistinguishable from the rest of the ring. So, is solder a bad thing that you should avoid at all costs? Of course not, solder is a key component in most finished jewelry and it makes working with jewelry a lot easier and more affordable. That said, if you have a piece of jewelry that has discolored, or if your skin reacts to the base metals in solder, you may want to remove the solder if possible. At our shop, we have a laser welder which allows us to do many of the jobs traditionally done with solder using the laser instead. We no longer need to use special solder alloys for joining metals because we can use regular karat gold wire with our laser. With this technique, we can oftentimes remove bothersome solder from existing jewelry and even make new jewelry entirely without solder. If you would like to learn more about solder or if you’re having some trouble with the solder in your jewelry and you are interested in having it removed (or the jewelry remade into something new) please don’t hesitate to contact us or leave a comment below. Can My Costume and Fashion Jewelry be Fixed?